WxL(in) 5” Urethane Cat. No. Stainless with premium #4 polished shelves in durable 16 gauge. Stainless doors with lockable handles and two keys. 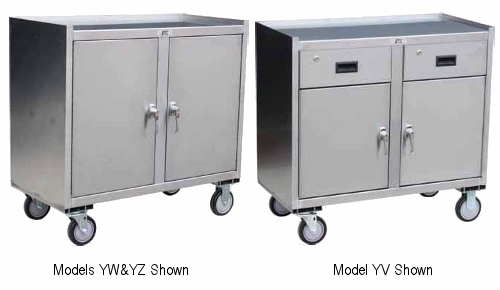 Locking Stainless Drawers (16"w x 16"d x 4-1/4"h) with 2 keys (Model YV only). Three sided 16 gauge stainless sheet construction. Stainless caster mounts for bolt on casters, 2 swivel & 2 rigid (for superior tracking). Steel or stainless caster rigs. Top shelf — flush front lip with other three sides up.